Below you fill find all funeral homes and cemeteries in or near Whitefield. Suburbs of Whitefield: Carroll, Dalton. 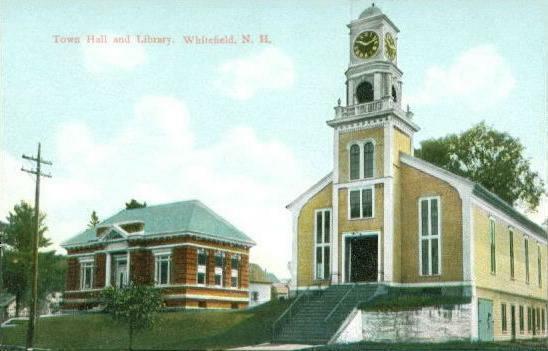 Whitefield is also known as: Whitefield and Whitefield , New Hampshire. Their current mayor is Mayor Duane Hall. Zip codes in the city: 03598. Some of the notable people born here have been: (anna maria gove). Whitefield is a town in Coos County, New Hampshire, USA, in the White Mountains Region. The population was 2,306 at the 2010 census. Situated on the northern edge of the White Mountains, Whitefield is home to the Mount Washington Regional Airport and the White Mountains Regional High School.Whitefield is part of the Berlin, NH–VT Micropolitan Statistical Area. The central village in the town, where 1,142 people resided at the 2010 census, is defined as the Whitefield census-designated place (CDP) and is located at the junction of U.S. Route 3, New Hampshire Route 116 and NH Route 142. It was revealed by Providence Journal on January 28th, 2015 that Dexter W Smith died in E Providence, Rhode Island. Smith was 94 years old and was born in Whitefield, NH. Send flowers to share your condolences and honor Dexter W's life. It was reported by Burlington Free Press on December 30th, 2013 that James T Dr "Jim" Bailey passed on in St Johnsbury, Vermont. Bailey was 85 years old and was born in Whitefield, NH. Send flowers to share your condolences and honor James T Dr "Jim"'s life. It was noted by Worcester Telegram & Gazette on May 26th, 2013 that Paul C Baker perished in Whitinsvile, Massachusetts. Baker was 79 years old and was born in Whitefield, NH. Send flowers to express your sorrow and honor Paul C's life. It was noted by Tampa Tribune on December 15th, 2011 that John Clark Brooks passed on in San Antonio, Florida. Brooks was 69 years old and was born in Whitefield, NH. Send flowers to share your condolences and honor John Clark's life. It was written on November 26th, 2011 that Ruth B Reynolds (Bishop) passed on in Whitefield, New Hampshire. Ms. Reynolds was 93 years old and was born in Shelburne, VT. Send flowers to share your condolences and honor Ruth B's life. It was disclosed by Worcester Telegram & Gazette on May 26th, 2011 that Cherlye A Gould (Thomas) perished in Leominster, Massachusetts. Ms. Gould was 61 years old and was born in Whitefield, NH. Send flowers to express your sympathy and honor Cherlye A's life. It was noted by Burlington Free Press on May 14th, 2011 that Dorene B Couturier (Bourassa) passed on in Burlington, Vermont. Ms. Couturier was 61 years old and was born in Whitefield, NH. Send flowers to express your sorrow and honor Dorene B's life. Others believe the name originated from earlier references to the snowy white fields one would see upon approach through any of the surrounding mountain passages. The population was 2,038 at the 2000 census. Early grantees included Jeremy Belknap, historian, and John Langdon, who succeeded John Wentworth (governor) Wentworth as governor. Whitefield has many fine examples of Victorian architecture, including a landmark bandstand built in 1875 on the picturesque common land With the entrance of the railroad in the 19th century, tourists discovered the town and its cool, clean mountain air. Whitefield is a New England town in Coos County, New Hampshire County, New Hampshire, USA, in the White Mountains Region. The official website for the city of Whitefield is https://www.whitefieldnh.org/. Listing all funeral homes in Whitefield, New Hampshire so you can easily send flowers to any location (same day delivery) or find any funeral service. We work with local florists and flower shops to offer same day delivery. You will find budget sympathy flowers in Whitefield here. Our funeral flowers are cheap in price but not in value.